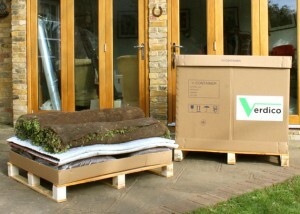 SIG Design & Technology has launched a new green roofing system that comes in a single delivery. Called VerdiRoof by Verdico, it’s available in a choice of covering; sedum blanket, plug plants and seeding and the growing medium is proven to be carbon negative. Easy to use, there are 10m2 of VerdiRoof per pallet and up to 250m2 can be delivered in one load, enhancing embodied energy. VerdiRoof is suitable for a warm/inverted roof build up. Its unique drainage system protects the waterproofing and helps sustain plant life. Even ‘greener’ than other systems, the growing medium for VerdiRoof is UK sourced and comprises pumice, bark compost, and a unique carbon capture pellet (which is a by-product of the UK aggregate and waste industry). In tests, the University of Greenwich found each cubic metre of extensive substrate to have a CO2 footprint of minus 7kg. SIG Design & Technology, in conjunction with Verdico VerdiRoof green roofs, can provide guaranteed built-up systems that replicate the natural growing environment for plants, creating lush, vibrant, biodiverse environments that can transform both new and refurbishment projects. SIG Design & Technology is a part of SIG Roofing, a leading division of SIG plc, a FTSE 250 listed company and the UK’s market leading specialist supplier to professionals in the building and construction industry. It designs and supplies flat roofs, green roofs, and zinc, copper and stainless steel roofing and cladding. SIG Design & Technology has put together an 8-step guide to identify the challenges and ensure that a roof’s design meets a building’s requirements. The eight steps follow the process from product selection and design expertise through to full guarantees and planned maintenance. This know-how is just part of the service that is provided absolutely free to customers.